Dr. Harsh Vardhan, Union Minister for Science & Technology and Earth Sciences, visited the National Centre for Cell Science (NCCS), an autonomous institute funded by the Department of Biotechnology (DBT), Government of India, on 3rd February, 2016. He was accompanied by Shri Jayant Sahasrabuddhe, National Organising Secretary,Vijnanabharati. Dr. Arvind Duggal, Adviser, DBT, was also present on this occasion. The Minister toured the Microbial Culture Collection (MCC), the third largest facility of such a kind in the world. While acknowledging the expanded efforts made by MCC in exploring and preserving the rich microbial biodiversity of India, he stated that that the facility should carry out more focussed research in one or two areas. interest and some of the new initiatives planned such as establishing an induced pluripotent stem cells (iPSC) bank, development of patient-derived cell lines from the Indian population and mapping of the human gut micro-biome of the Indian population. related to human health, such as cancer, diabetes and other metabolic diseases, infectious diseases and regenerative medicine. He was especially pleased to learn that NCCS has not only been actively engaged in productive basic research, but has also been contributing towards the betterment of society through other means, such as by generating high-quality human resources through its educational and training programmes, transferring its technologies to public hospitals and through outreach activities. 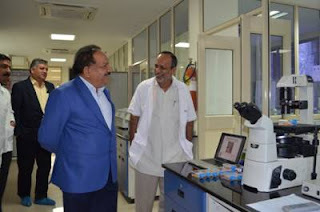 Dr. Harsh Vardhan later visited some of the laboratories of NCCS and the animal cell repository of NCCS, where he interacted with the scientists, students and staff. During his visit to this national facility, he acknowledged the enormity of the task of supplying cell lines to many institutions across the country. India through the Department of Biotechnology, Ministry of Science and Technology signed a Cooperation Agreement to acquire the status of the Associate Member State European Molecular Biology Organisation (EMBO). This would strengthen scientific interaction and collaborative research between India and Europe in this field. After the signing of an agreement with Singapore by EMBC in July 2015, India will now become second such country outside the European region. With this India as an EMBC Associate Member State, researchers working in India are now eligible to participate in all EMBO programmes and activities. Indian scientists can apply to EMBO’s programmes, such as long-term fellowships for postdoctoral researchers, short-term fellowships, courses and workshops, as well as the EMBO Young InvestigatorProgramme. At the same time, Europe will benefit from networking with the top-level scientists in India’s research community. The official kick-off launch ceremony of the agreement was held in New Delhi, India today (4 February 2016). Scientific presentations were made by Nobel Laureates Christiane Nüsslein-Volhard and Ada E. Yonath to mark the occasion. An EMBO-led delegation of ten researchers is in India now to visit various institutes across the country and meet with Indian scientists and government representatives. This newly forged cooperation will build upon already existing links between Indian and European scientists. In 2015, 10 Indian postdoctoral researchers received an EMBO Long-Term Fellowship to work in Europe and eight India-based scientists received the EMBO Short-Term Fellowship. A satellite symposium focusing on research in India has been an integral part of the annual conference The EMBO Meeting.